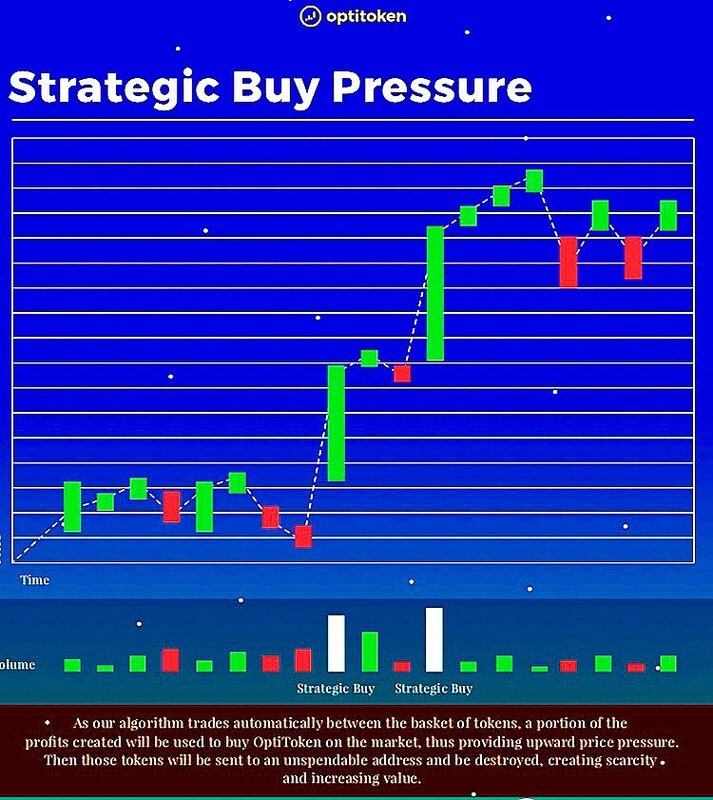 OptiToken’s revolutionary strategies of “Buy Pressure” and “Strategic Scarcity” create perfect conditions for the cryptocurrency to thrive. As their algorithm trades automatically between their basket of tokens, a portion of the profits created will be used to buy OptiToken on actual exchanges, thus providing upward price pressure. Afterward, all purchased tokens will be burned VIA an unspendable address and be destroyed, creating scarcity and further increasing value for adopters. Below is a graphical model of how price action would work once OptiToken is being traded openly on an exchange. The effect of this strategy is to nurture a market that has immense strategic buy support. It also solves an extremely common problem of new ICO’s, that hit exchanges and are met with very little buy volume awaiting them. Not only does OptiToken solve this, but uses tokenization in an innovative new way to create a cryptocurrency that has the potential to appreciate, or offer support, in price even in bear markets. Given that the portfolio’s value can increase even in bear markets like the last one, OptiToken’s price on exchanges can potentially grow even when most coins are in the red. This, in turn, can create serious organic marketing in the form of FOMO, as foreign buyers jump on the trend of positive price movers. The projects presale is live now at https://OptiToken.io/presale and is allowing people to buy presale price without a minimum for a short time. Thereafter the minimum buy amount will be €2500 or equivalent in crypto. You can also whitelist now for 2 more weeks for their ICO on the companies home page.